Mindfulness is all the go at the moment! Many of us might even have a mindfulness adult colouring book on the Christmas list. But why should we pay attention to this new ‘hot topic’? What is it – and why is it good for us? What they found out was compelling! The simple act of practicing mindfulness had a significant impact on 8 regions in the brain, with 2 regions of particular importance – one was the area responsible for self control – and another, the area responsible for resilience. Ok – the science proves it is good for me – so what exactly is mindfulness? And are there easy ways to make it part of my day that don’t just involve meditation? Pets – take a few moments to notice their fur, their wagging tail! Do any of those ideas resonate? Pick one that does and make a small amount of time each day to give it a go. For example, today – each time you walk to a meeting, focus soley on the walking process. Don’t think about your intended key arguments or contributions. Make time for that before you leave. Instead after you leave your desk, take a few minutes to notice each step, observe and feel your feet lift and hit the ground. Notice your arms swing as you walk. Observe your breathing. Observe the people you pass on your way. Then, when you arrive, focus on the task at hand. But it can be surprisingly tricky to get the mind to quieten. If you find your mind wandering – notice that, don’t judge and gently pull it back on task. As with any new skill, lots of practice helps to rewire the neural pathways and soon it will become much more natural to you. 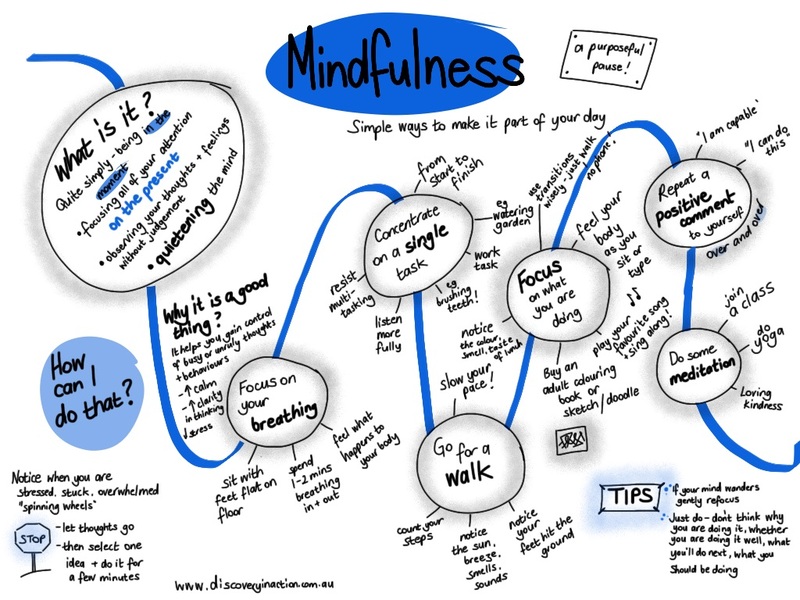 Click here to Dr Travis Bradberry blog post which explains a little more about the science and research supporting mindfulness, and some more ideas about how to make mindfulness a part of your day. We run a program called Enhancing your Resilience. Click here to see the course outline.